The recipe is in 2 parts ,the first part being the pate and the second the Mandarin jelly. I based it all over a 6 day period , start to finish with a little something to do each day so i`ll write the method up using the 6 day format. 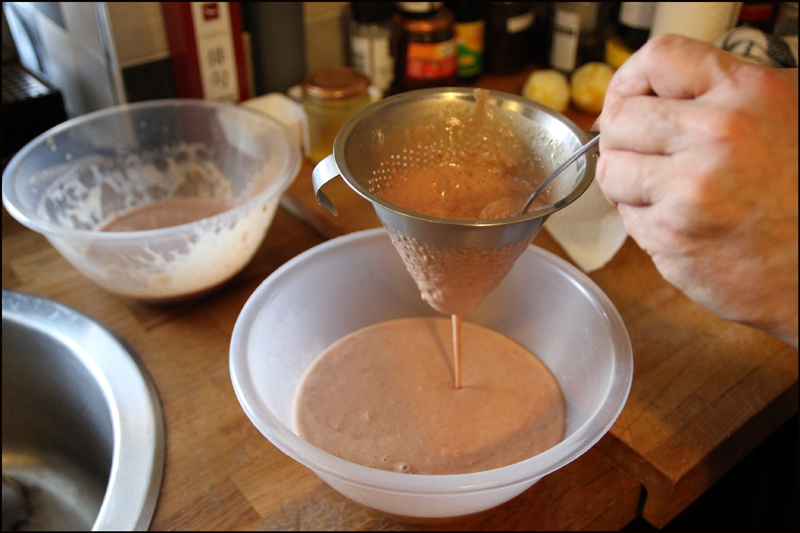 Here`s what you`ll need to make the Chicken liver parfait.The recipe makes 6 portions with the moulds that i used. 100g of Shallots – finely sliced. 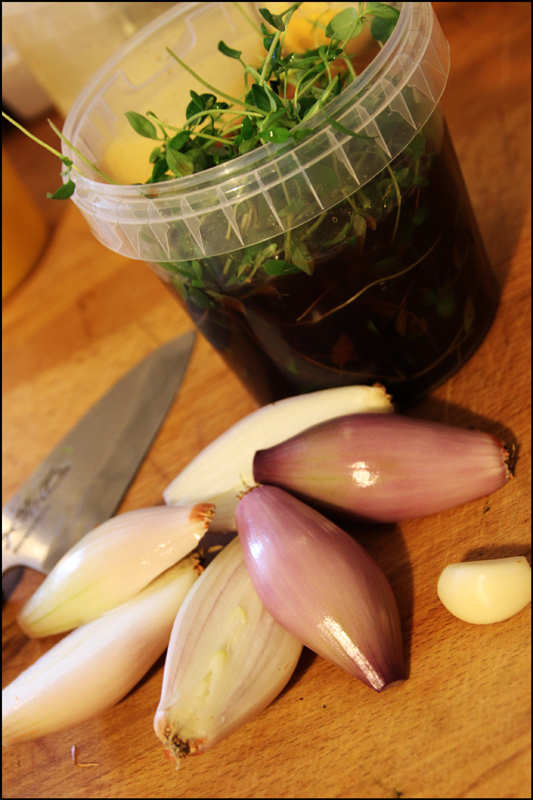 DAY 1 Place the Shallots , Garlic and Thyme in a container with the Madeira , Ruby and white Port and the Brandy and set aside overnight ( or up to 24 hours ) to marinate. DAY 2 Heat the marinated mixture in a small saucepan until almost all of the liquid has evaporated and approximately only a tablespoon or so remains. 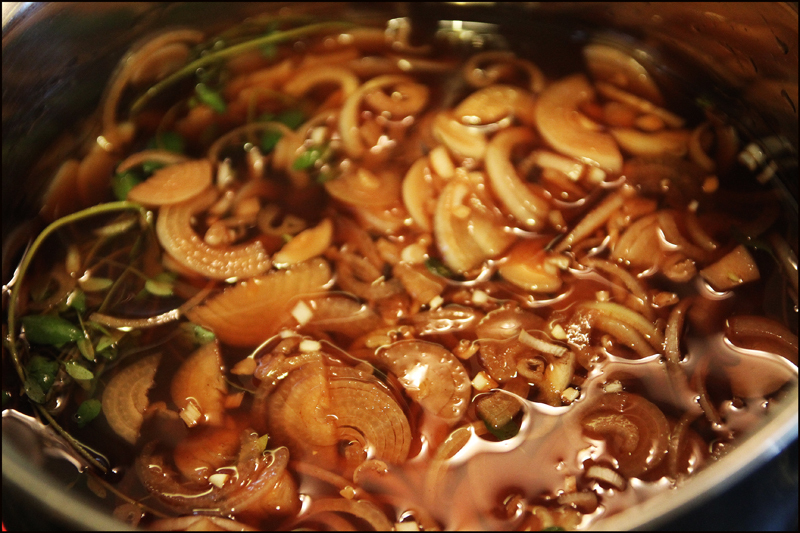 Stir regularly as the liquid is reducing so nothing sticks and burns on the bottom of the pan. Remove from the heat and then discard the bunch of Thyme. Preheat the oven to 100 deg C , fill a bain marie with about 5 cms of warm water and place into the oven.Get a large pan of water and place over the heat until it reaches a temperature of 50 deg C , regulate the heat until it stabilizes at this temperature. 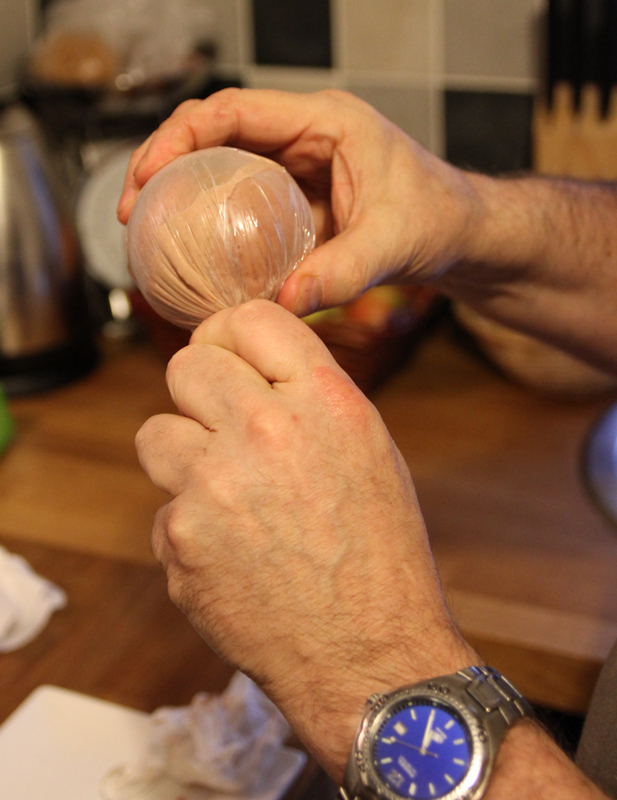 Sprinkle the table salt over the chicken livers and then put them into a plastic freezer bag and tie in a firm knot. ( make sure all of the air is out of the bag before tying ). 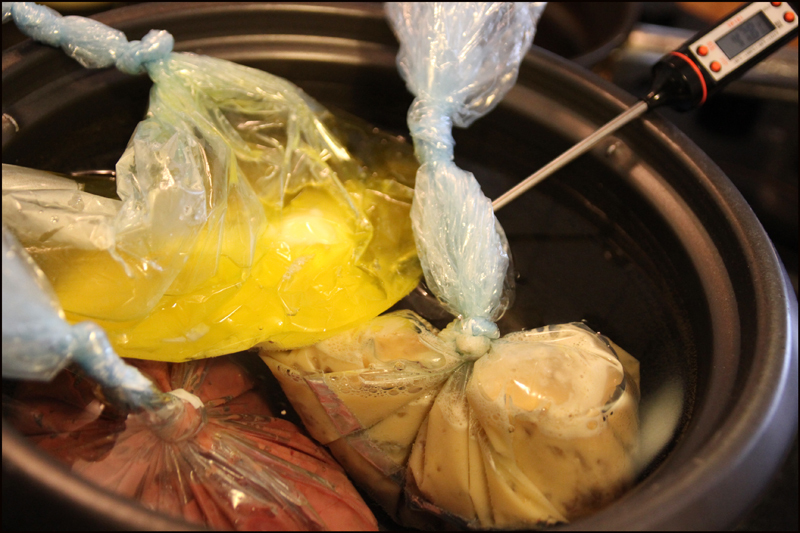 Place the eggs and alcohol reduction mixture into a second bag , remove the air and tie tightly again. 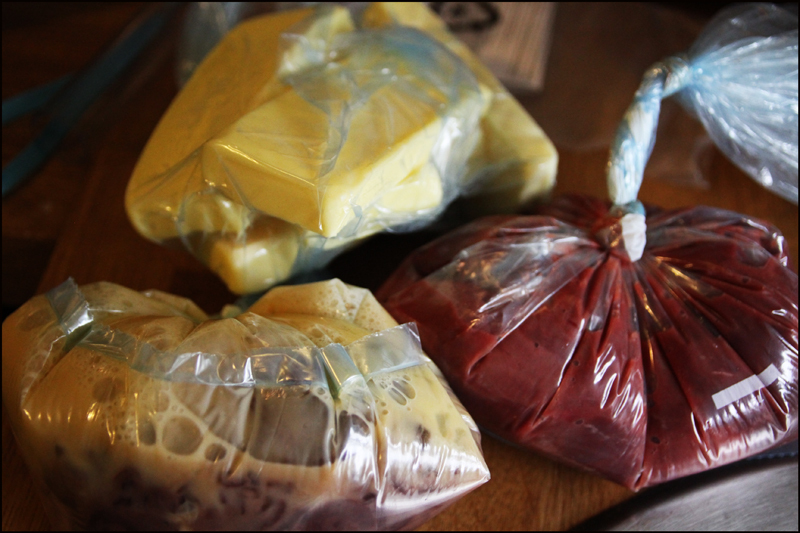 Place the butter in a third bag , remove the air and also tie this bag very tightly.Place the three bags into the water bath for 20 minutes, keeping the temperature at 50 deg C.
Remove the bags from the water bath , cut them open and place the contents of all three bags into a plastic container ( or a food processor ). Blitz them on full power until they reach the consistency of a fine puree. 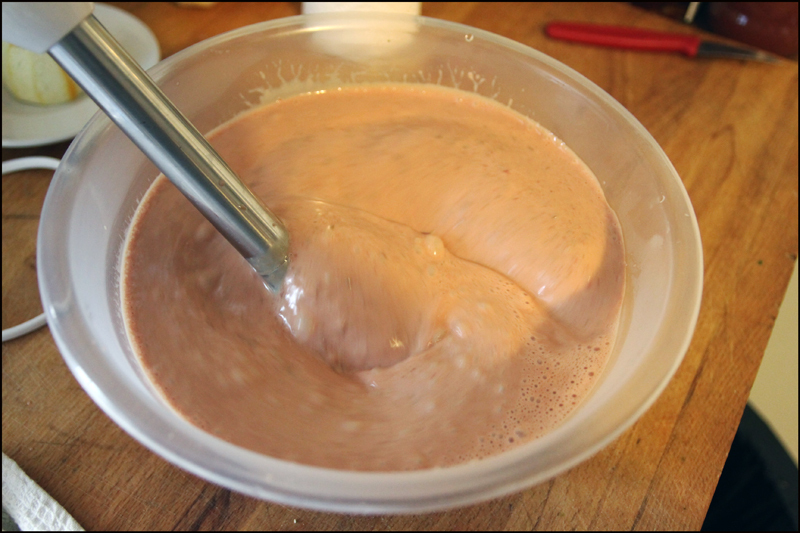 Pass the mixture through a Chinoise or a fine sieve to remove any stray pieces and sinews. 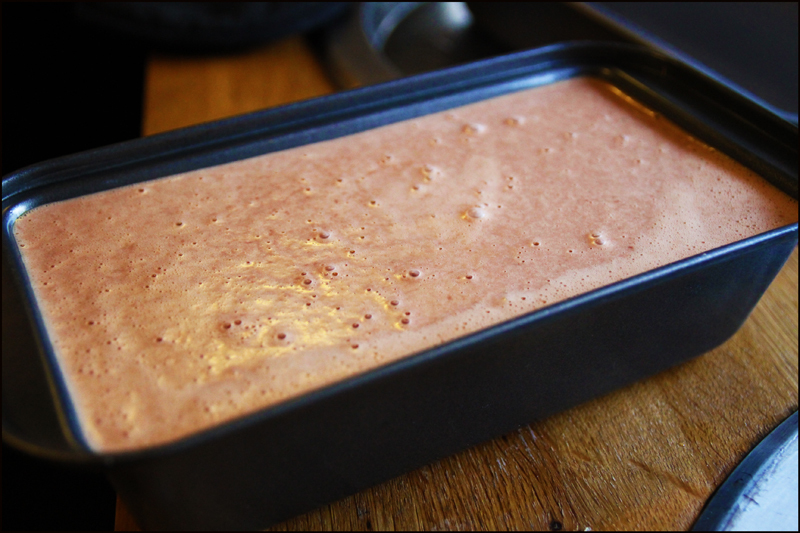 Pour the parfait mixture into a terrine dish or in my case , a non stick loaf tin. Tap gently to settle out any bubbles and then cover the parfait with silver foil. Gently carry this to the oven and the waiting water bath. Cook gently in the oven until the internal temperature of the parfait reaches 64 deg C. I used a digital probe thermometer for this and it took approximately 1 -1/4 hours at 100 deg c to reach this temperature. Once cooked , remove the parfait from the oven and then allow it to cool. Transfer to the fridge and allow to firm up for 24 hours. DAY 3 – To make the fruits , using a spoon , scoop out the pate and use it to fill the half dome moulds.I got these moulds off ebay, they`re made of Silicone and slightly on the large side but i`m happy to eat large Mandarin size Pates any day. Level off the tops of the moulds with a spatula to make them as smooth as possible. Don`t forget that the 2 halves need to stick together perfectly so take care in levelling them. Place a piece of plastic wrap gently over the surface of the parfaits and place into the freezer to solidify into shape until completely frozen. DAY 4 Remove the Silicone moulds from the freezer and carefully unmould the Parfait halves. 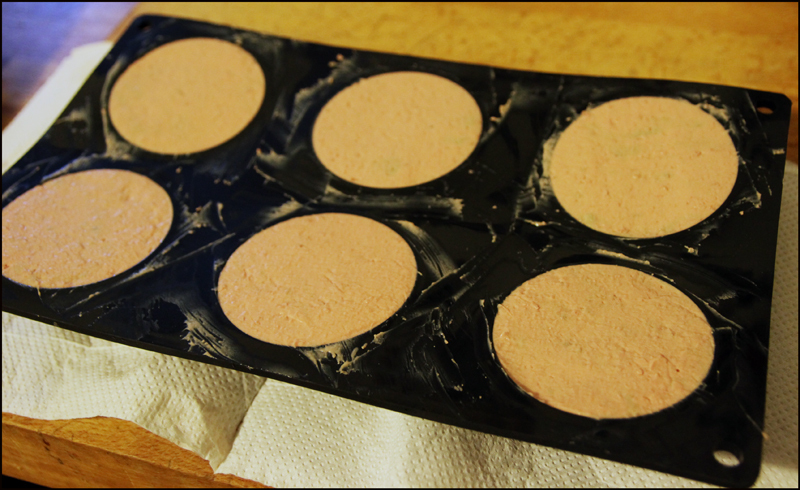 Gently heat the flat surface of one half with a blowtorch to slightly melt the frozen pate and press the 2 halves gently together. 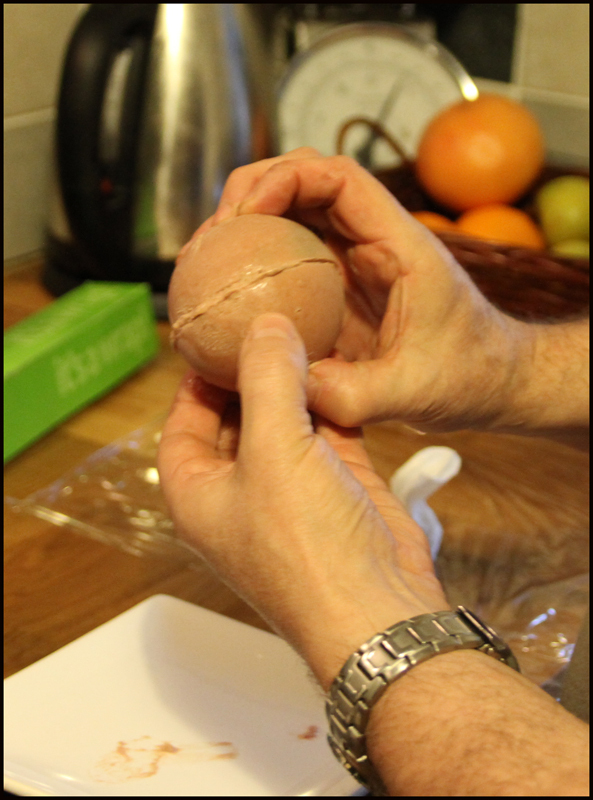 Cover the ball with cling film and twist together tightly to seal. Place back into the freezer to set the halves into a ball shape. I placed a small Bamboo skewer into the Parfaits at this stage to aid with the “dipping” later. DAY 5 To make the Mandarin jelly. I couldn`t find Mandarin puree anywhere so ended up having to make my own. 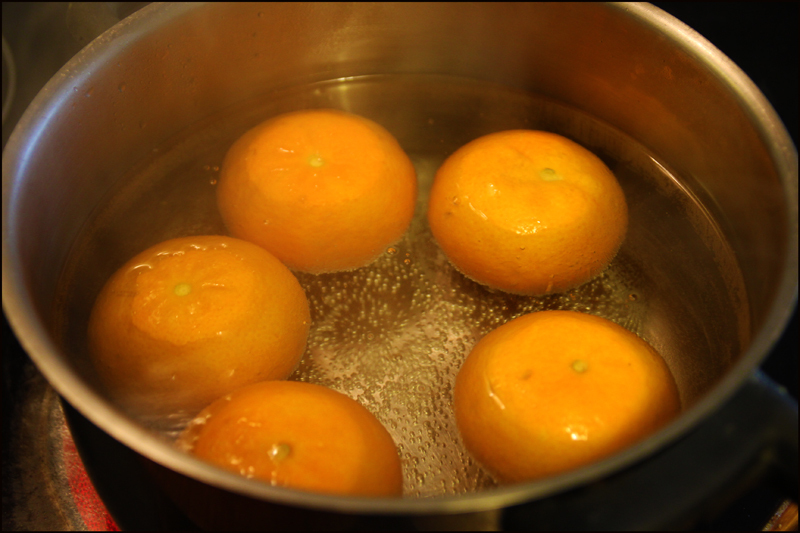 I simply took 5 fresh Mandarins , and very gently simmered them for 2 hours in a pan of water. I drained the water off and then blitzed the mandarins with a stick blender to puree them. The puree was then passed through a fine sieve and there i had my puree.I then weighed out the 500g that i needed. Try and get Mandarin puree as a priority as I found the skin adds bitterness to the jelly. Next time I make this ill just scrap the skin and puree the fruit. The leaf gelatine was added to a jug of water to allow it to soften for five minutes. 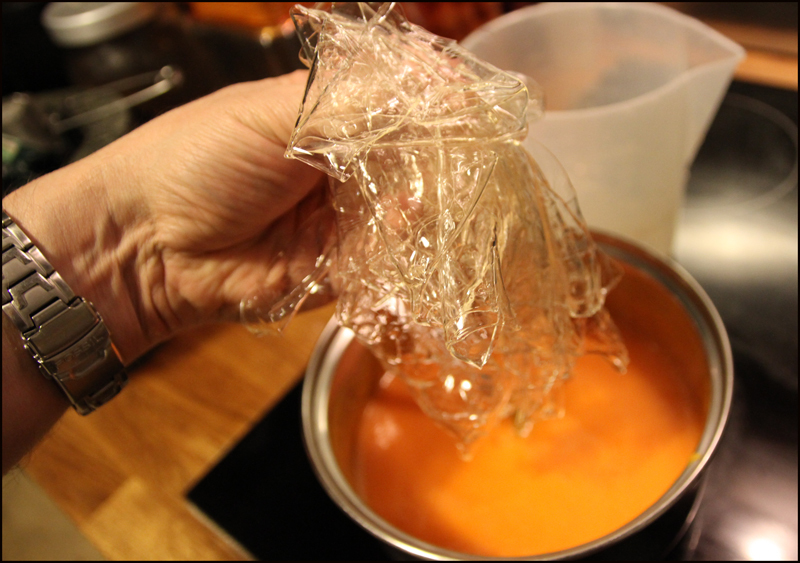 While the gelatine was softening i added the glucose to the hot mandarin puree and stirred it together. After 5 minutes i drained the gelatine and added it to the hot puree and stirred to dissolve. The Mandarin oil and paprika extract were then added to the puree. The jelly can now be stored in the fridge until the parfaits are ready to dip. So on to the dipping stage of the recipe. 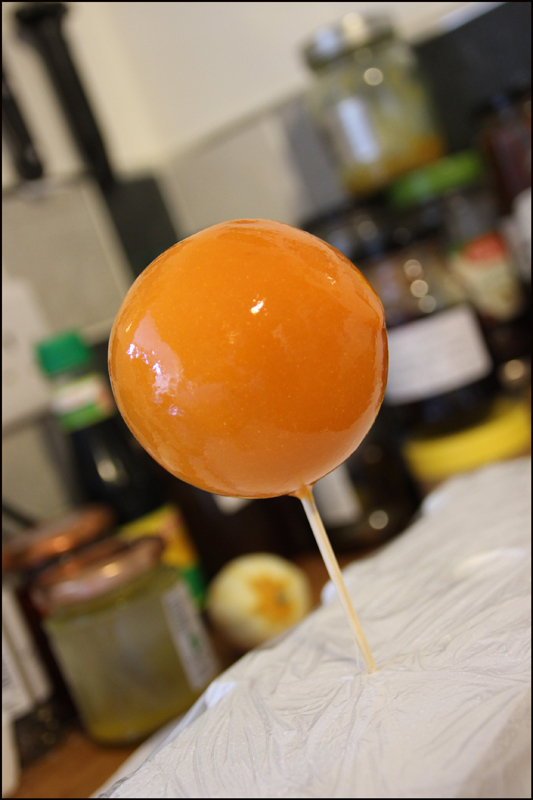 Gently warm the Mandarin jelly in a small saucepan until it melts back to a liquid.Allow the jelly to cool to room temperature (28 deg C) .Remove the Clingfilm from the frozen parfait ball and holding the bamboo skewer, carefully dip the whole parfait ball into the Mandarin jelly. 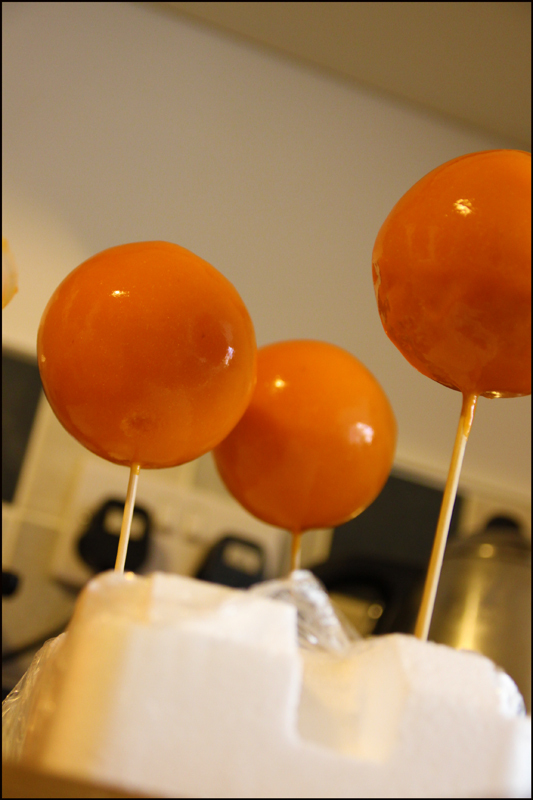 Allow the excess to drip off and place the skewer into a piece of polystyrene to allow the jelly to set. This will take literally 30 seconds because of the frozen parfait. My jelly was quite a thick mixture , it probably should have been a lot more liquid in its consistency but i didn`t have a recipe for Mandarin puree so i just made it up as i went along. I dipped the balls in the jelly twice more.Once would have been enough so proceed with this in mind. Place the balls back into the fridge preferably in a lidded container and allow them to slowly defrost for at least 6 hours….or overnight. DAY 5 Once the Mandarin parfaits are defrosted , remove them from the fridge. Place your thumb on the top and gently press down on the jelly to create a flattened indent. This creates the realistic Mandarin shape and stops them looking too rounded. To finish the fruits off I used Bay leaves fresh from the tree. 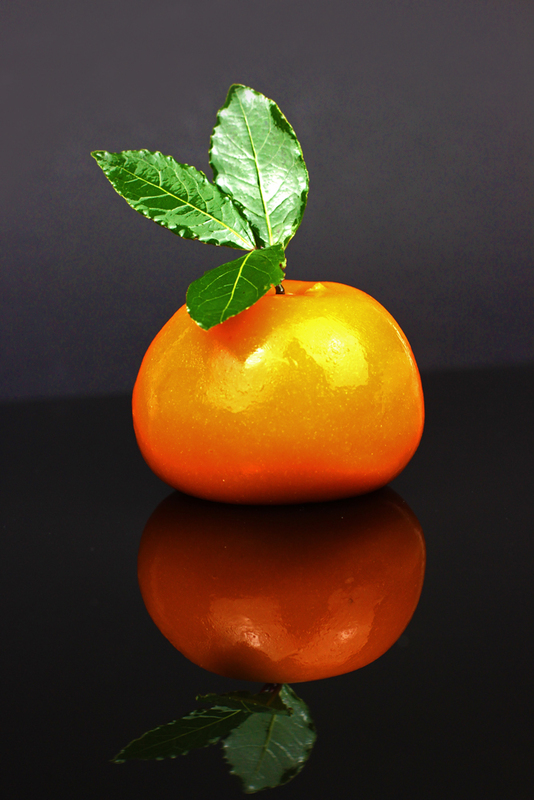 My Mandarin fruit was brought to life. Little cloves could also be used to create a realistic finish. It was definitely well worth the time and effort to make these “Meat fruits” , they would be fantastic served up as a starter on xmas day. Try and get the correct sized moulds if possible as the ones that i used were pretty big , a little too big for a starter portion.Good luck with your efforts and enjoy the experience. Hopefully you will get to taste the “real deal” soon. Previous Post Temptation from my diet , Sticky Cumbrian Gingerbread. Next Post Le Champignon Sauvage, 12 course, 2 star michelin. That’s extraordinary, you definitely deserve to jump to the front of the queue. What dedication. You should make sure Heston knows about this, perhaps I can help with that. Extraordinary! This is the first time I’ve come across your blog, and I’m so glad I did. Amazing I bet it taste great too well done ! This is amazing! Absolutely brilliant! Wow. Seriously impressive. It was only the other day that a bunch of bloggers were discussing doing a #meatfruitoff – no point now! You’ve clearly mastered it!! Well done. Wow. That’s some commitment to meatfruit. Genuinely amazing! Forget Heston, looks like I need to come to yours for dinner! Awesome stuff. Wow… that’s dedication! Seriously impressive – although I’m not daring enough to embark on a 5 day mission to try to recreate this (even with the aid of your amazing and helpful recipe), I’d love to know how yours compares to the real thing. It certainly looks just as good! 🙂 Hope you get to taste Heston’s version soon! He dude, these would indeed be awesome as a starter on Christmas, although I’m sure someone will be clever enough to sell them in the supermarket. More importantly, are they tasty? WOW! I’m almost tempted to try it myself! Looks really good, well done. We have, after much effort, got a booking at Dinner, but I am keen to have a go at meat fruit, also finding it difficult to find mandarin puree, so delighted to find your site (no sous vide) . Where did you manage to get dome moulds? Also having trouble with this. Grateful for any suggestions. This is so cool. Well Done! I saved the recipe and will have to try giving it a shot since I have about 1200gr of organic chicken livers sitting in my freezer and need to be used. Problem is what to do with the rest of them?? Maybe roll in bread crumbs and deep fry quickly to servee with a good spicy dipping sauce. Cant beat them pan fried with marjoram , shallots , brandy and cream on toast…fantastic. I know the answer must seem obvious, but, unfortunately for me it is not. I have never eaten pate either so I am really at a loss. Please tell me is this meant to be eaten cold, it seems as if you warm it the coating would melt off. But, is it good cold? You did the whole presentation for us, but, you didn’t say if it tast good. Also, why did you say this is best served at xmas, is it something that would not be considered enjoyable any other time of year? Thank you in advance for your answers. Definitely a good idea to eat this cold , the pates are dipped at 28 deg and then immediately placed into the fridge again.Ive never known anyone to eat warm pate either so really not a good idea.The whole thing is very xmas and a fantastic festive starter.Of course you could eat it seven days a week but its kind of a special occasion one for me.Oh and as for the taste, its very WOW, creamy smooth pate and a tangy citrus jelly spread onto warm brioche or sourdough bread….definitely well worth the effort. Stunning! Just read a review of Dinner in the NYtimes and was intrigued by the description of this dish. It’s amazing that you were able to create it yourself. The effort to achieve the trompe l’oeil is daunting, but the flavor combination seems fantastic. Worth making the chicken parfait with some jelly alongside? Absolutely , well worth it.Try and get fresh livers if you can.Mine turned out ever so slightly too `wet` but wonderful flavour.As for making them seperate…..Nah , just jump into the deep end, it was good fun. This is some dedicated stuff, seriously well done. I’m a similar Heston recreator and was linked here by the wonderful InSearchOfHeston. So impressive……. one for Christmas most certainly. I can’t wait to give a go. So glad your recipe & instructions de-construct! It wouldnt surprise me…but i really dont think it has to be honest., i ate it slowly and very carefully , analysing every mouthful….i didnt get any foie gras flavours at all….and to be honest , it doest need any. I thought your “meat fruits” looked amazing and so like the ones at Dinner. I was lucky enough to go there in April and it was fantastic. I am going to have a go for New year’s Eve but am having difficulty finding the paprika extract and the right size moulds. Please could you tell me where I can find them. The homechocolate factory seem to sell some moulds but they are £100- a bit expensive I think! The Paprika extract doesnt add a lot to the flavour of the jelly , its more of a “friendly” way to get the correct orange colour.It`s actually available from Neals yard in covent garden but i used orange food colouring. 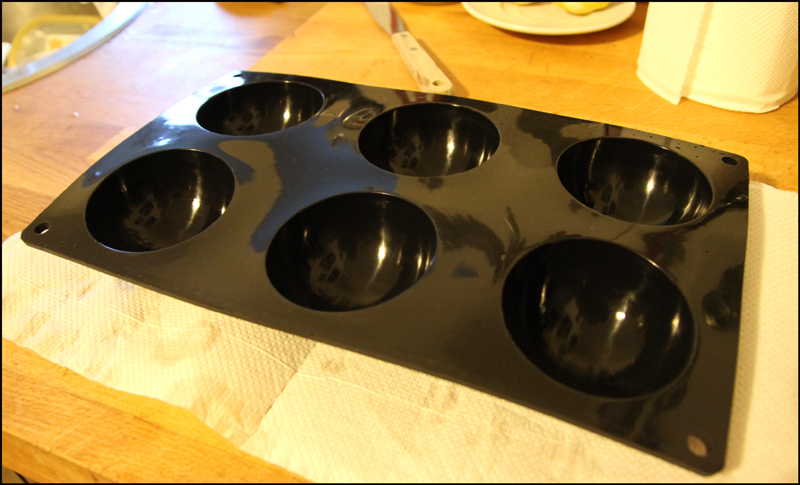 As for the moulds… £10 from the homechocolatefactory… black silicone and ive just taken delivery of some smaller ones for my meat fruit xmas day starter. Thanks for the information. One more question- I can’t find fresh mandarin oranges. Would satsummas be ok or even tinned mandarin oranges in fruit juice. OH JEEZ…Dont go using tinned ones Sarah.Ive just been to Lidl and bought a couple of bags of Clementines to use for mine…which im starting on Sunday. Now I thought I went to a lot of effort to cook but this is truly amazing! Well done! Hi , my recipe for the meat fruit was exactly as it was written down on the internet.I followed it to the letter almost.The colour of my finished parfait was different to the restaurant version.This i put down to the fact that i didnt put any preservative ( nitrates) in my version as i couldnt get hold of any.The nitrates preserve the colour and stop it from oxidising. Cheers and let me know how you got on please. Just about to give this a go for a Jubilee party. You say it makes 6 portions, do you mean it makes 6 pate halves (e.g. 3 fruits’ worth)? The quantities will make 6 full fruits. Saying that , my moulds were way too big ( 7 cm ) and they turned out meat ” oranges” The second time i used different size moulds ( 6 cm ) and to be honest they were still a bit on the large size ( i got 8 fruits ). 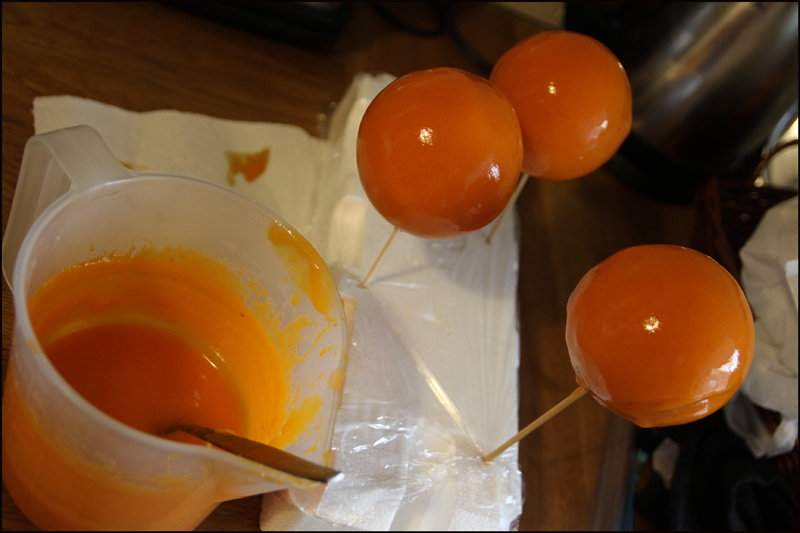 Next time ill use 5cm silicone moulds and that should make roughly 10 – 12 fruits of the perfect size. I had already been eyeing up 7cm moulds, but I am envisaging these being shared among people at a party so I think I might get away with it. I am also going for a vegetarian version so I will definitely let you know how they turn out. Thanks CF! 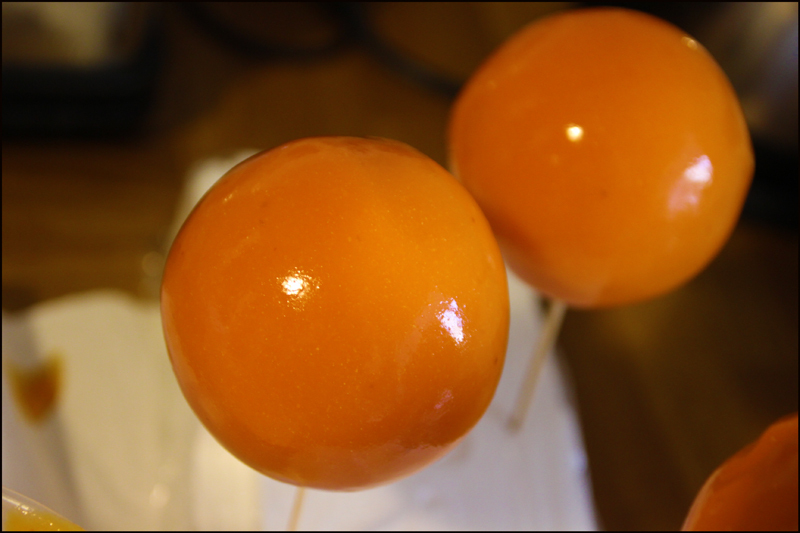 One theyre dipped twice in the puree youll see for yourself , theyre as big as a good size orange. Go for a happy medium and try the 6cm ones. I will bow to your experience! Well I gave it a go – couldn\’t get the moulds in time and made a vegetarian version but it was definitely inspired by your recipe. Thanks! Had this dish at the Mandarin Oriental 2 weeks ago – fabulous. Will definitely try it at home. Wow looks really impressive seems like you have used the refinement they use at Dinner!! Hi Ben , no i just reduced the piquid , not flambe. 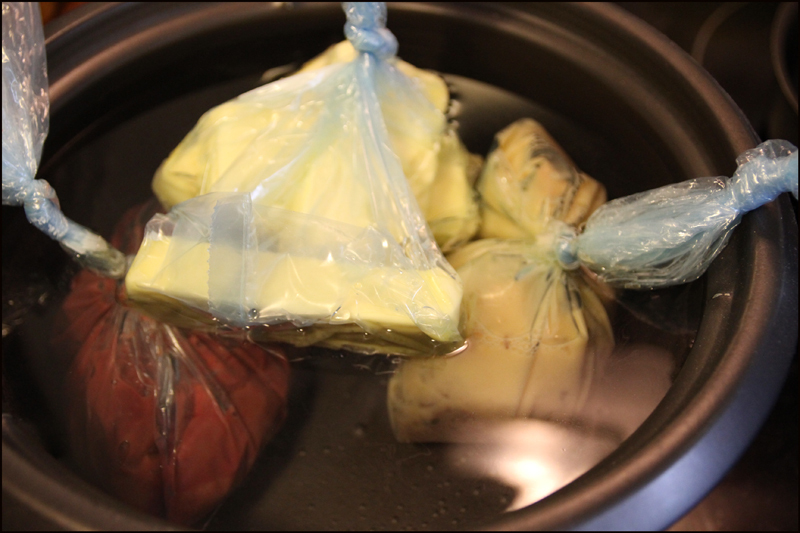 You need to cook them in the bags simply to get them to the correct temperature , them liquidize then pour into the terrine to cook. Hi Ben , no i just reduced the liquid , not flambe. 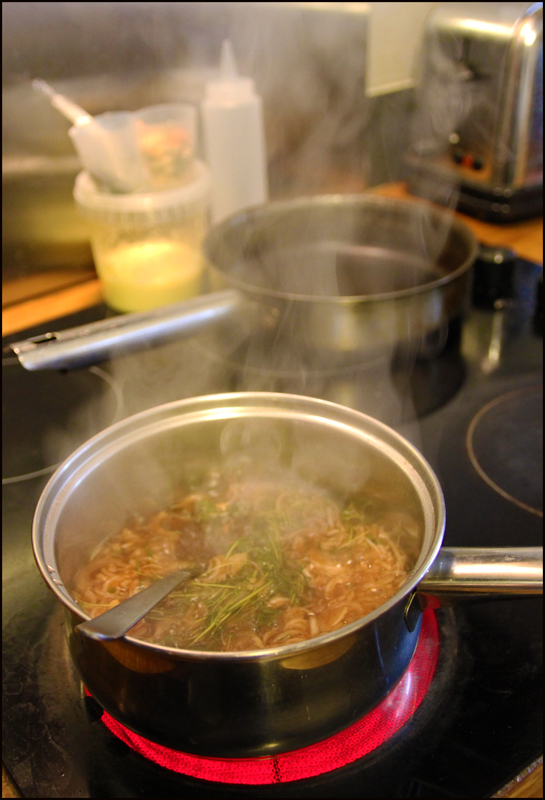 First stage , the bain marie is used to get everything up to temperature…the onions , the livers , egg and butter. 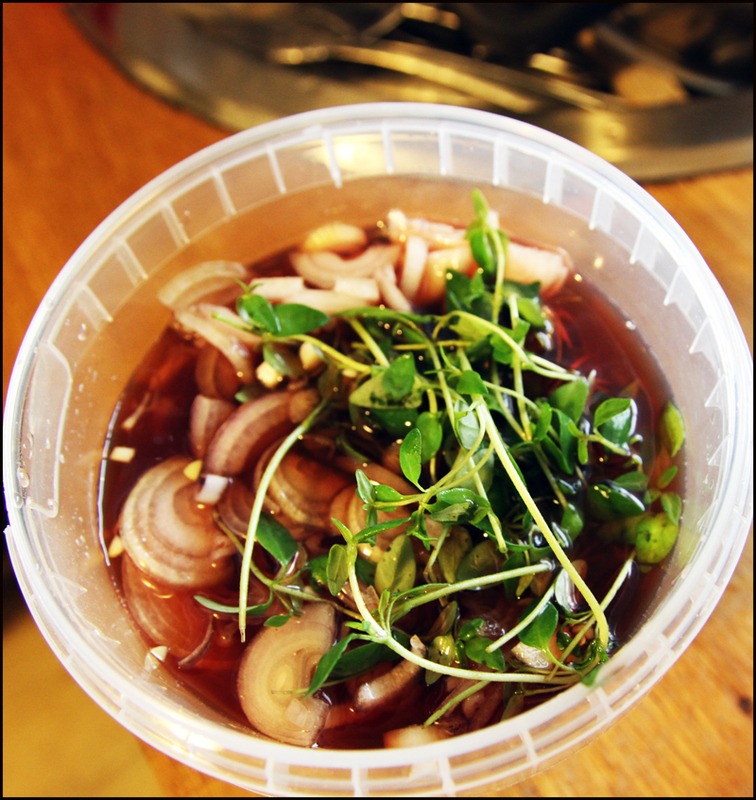 third stage – pour everything into the terrine and cook in the oven in a water bath and then allow to cool. 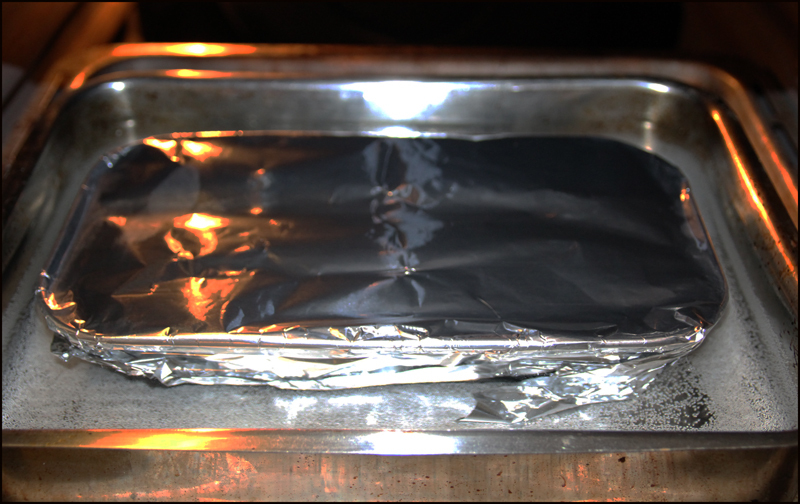 you need to cook in the bain marie in the oven wrapped in foil until the pate is cooked right through .Then allow to cool and place in the fridge to set. be warned….it oxides very fast so use some salt petre if need be. Ben I’m going to make this recipe this week and I have a sous vide. I was also thinking of putting the pureed parfait mixture into a bag and then cooking in the sous vide at 64 degree (the second cook). Did your’s turn out ok or did you end up cooking in a water bath in the oven? Thanks! 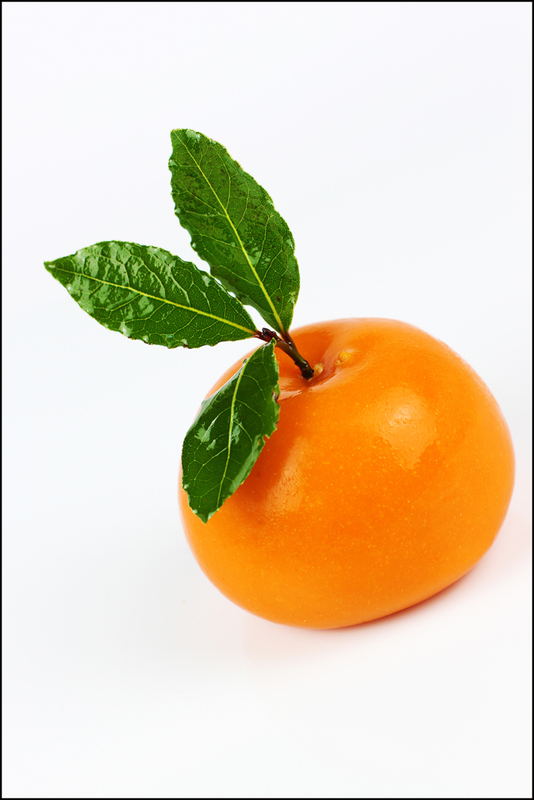 You have not created the surface of the madarine skin to be looked like the mandarin which is slightly rough and tiny hole on it. I would be grateful if you could tell me how it is done. When I had it at Heston’s restaurant it’s skin was just like a real mandarine not smooth gelatine skin!! Hi sacha , i tried to create the same speckled skin with one of my fruits and it ended up ruined. The secret i believe is to put them into the freezer so the jelly freezes once they are dipped. The result of the freezing is to damage the jelly…..i obviously done something wrong. Maybe a Heston secret ? looks freaking amazing! never in a million years would I dare to attempt that! what thermometer did you use (saw in one of the pics)? planning to get one for making macarons with the italian meringue method. any advice or suggestions? thanks. Just a simple one off ebay Damien, theyre so cheap. Brilliant. And have you by any chance tried the duck mousse in orange jelly recipe from Heston’s Feast? I want to try it. Thanks Heide and no not yet….Maybe Xmas. id dip them xmas eve night then leave them to defrost overnight in the fridge.press them into shape xmas morning and all should be well. I believe they freeze them with the jelly on at hestons to get the peel effect. i tried it and mine failed. Oh i just used the Gelatine from Tescos Mel.Next time i do it ill make sure the puree is a lot thinner as ive pureed the skins and everything last 2 efforts. I have the opportunity to taste that superb entry at Dinner last month, and congratulation for you, well done. You encourage me doing as my Christmas main entrance over here at Floripa – SC-Brasil. Amazing guide! I couldnt stop thinking about making “meat fruit” myself after I read your blog. I tried the mandarin puree which turned out disastrous. Dont know what I did wrong but the puree was completely unedible. I tasted very bitter and the smell was kind of odd. I was wondering if you have to peel the mandarins after cooking since I heard that the white parts below the orange skin taste bitter. It also came out very thick, more like a paste than a puree. Did you use some special variety of mandarin? Yeah , its trial and error i`m afraid. Mine was bitter both times because i boiled the mandarins in their skins then liquidized and sieved.Next time i make it ill just peel the fruit first and try it that way using only the flesh.Itll be a lot sweeter then. The Mandarins i used were straight from the supermarket. Just had the ‘real deal’ today – now tempted to make it for myself at home so I can have it every day. Simply amazing – thanks for the recipe! amazing, great work! what strength leaf gelatine did you use… ie. titanium, gold etc. Hi, I am planning on making these for a starter one day soon and was wondering if you could answer a few queries. For the Mandarin Puree do you boil them with the skins on, peel them and blitz without the skin? and what does the mandarin oil bring to the dish, as i cannot find any and am considering leaving it out of the dish? I just made these and to make the purée I took the skin off, boiled down and then puréed them. Finally put it brought a sieve. It didnt have any of the bitterness issues others have reported so i am sticking with that way of doing it from now on. The mandrain oil I found on eBay for a couple of quid and it did make a big difference to the taste and aroma. I left out the liquid glucose though and had no ill effects in terms of outcome. I think (and assume) the restaurant uses a commercial fruit purée. Those are pretty much just blended pulp, not heated or reduced. Those pureés are also quite runny. When I made this dish I heated/puréed whole mandarins, so the pureé ended up too thick. I would go for a commercial puree (like Boiron), or just blend/sieve the fresh pulp. I ate a Heston’s Dinner a few nights ago and had the meat fruit. Im now intent on recreating them! I am planning on making these for Wednesday next week. I have bought all of the necessary equipment and ingredients! May I just ask which kind of mandarin oil you used? As the only one I can seem to find is an essential oil and I’m not sure if this is suitable for cooking? Also I have read from the comments it would be ok to make the mandarin purée without the peel? Thanks a lot and massive respect and gratitude for making them yourself so well and posting the recipe! 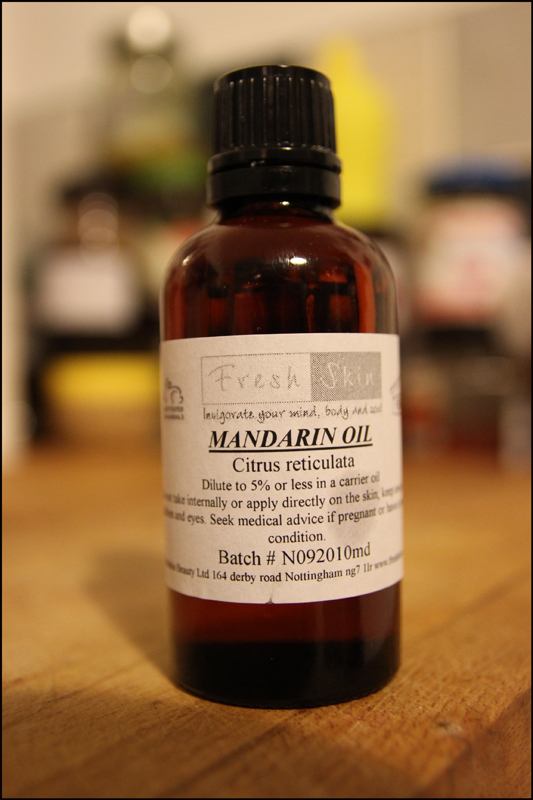 Yes , its the Mandarin essential oil , basically just pure oils from the citrus skins.I got mine off ebay. The puree seems to be a little bit of a discussion point….definitely do not use the skins. Next time I make it im just gonna peel the mandarins and then puree them in a processor. The skins make the puree far too bitter. Perfect I have just ordered some now! I’m going to remove all the pith to stop it being bitter and perhaps add a splash of Cointreau, what do you think? Very excited to get started tomorrow! If it all goes to plan I shall be sure to post a picture! I am serving my meat fruit tonight…and success! They have all gone perfectly and I even managed to get the peel effect on my jelly! More so than Heston’s! So I made it again with just the simmered peel and also some fresh madarin segments and no bitterness at all!! Plus it tasted much nicer! I am literally in the middle of making this and your pictures and everything else are going to help enormously! We are serving this as a canapé at a friend’s house at Xmas day lunch. What did you serve with it? Needs no accompaniment apart from toasted brioche….simple and amazing. One of my meat fruits with a homemade loaf of brioche! Wow….. awesome. .. you married ???? Ha ha. Well done, it ain’t an easy one. Haha! No I’m too young for that! made this for a weekend dinner party… i would say pink good ….. red / bloody bad, as i worry about food posing i took mine up to 65 at the centre BUT think a better option that i will try next time is as Ben suggests cooking in sous vide set to 65 , then no way to over cook and can garantte temp achievd throught. Hi, just wondering who long in advance could I make these (getting to the freezer stage so they just have to be defrosted and then dipped). Could they stay in the freezer for a week or do you think that would be a problem? Thank you so much for this recipe. I’m in Australia, but have been to Heston’s restaurant “Dinner” in London and it is amazing. I can’t way to try this recipe and hopefully impress my friends! Your post is fantastic. Thank you so much for putting such a huge effort into this! I would guess you could keep them frozen at a few stages. The half done stage and also the stuck together stage would be fine. I’ve recently found out that the fruits are re frozen after the first dip into the puree. This gives them their peel effect on the skin. Having made the parfait before I realise how easy it is to recreate and your description is great. Having had thdish at dinner a couple of days ago, your post here really makes me feel confident to give this a go. Just checking this recipe out as I first made this from the times recipe some time ago when Heston was doing the column in the Sunday Times magazine and the chicken livers were left to soak in milk for 24 hours to remove the slight bitterness. What’s the bloom value for the gelatin leaves you use? Ermmmm…..Tescos finest for me sir. Really enjoyed reading this. I am sitting here dreaming about the meat fruit we were so fortunate to try at “dinner by Heston” in Melbourne AU, earlier this year as I spread my toast with deli bought pate that falls so short. I am sure you would have enjoyed the “dining experience” as we did. 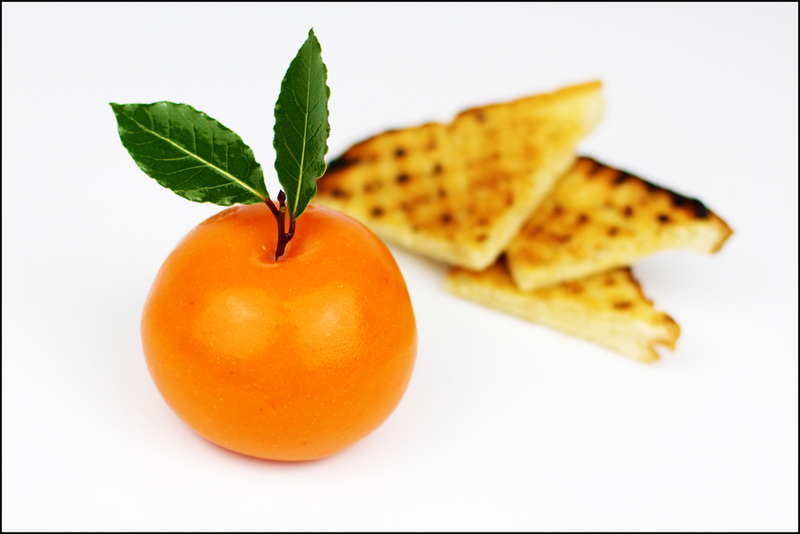 I made Meat Fruit and Brioche about 3 years ago using this blog. Do you have an email I can send you the photos to? Quite pleased with the result this time!